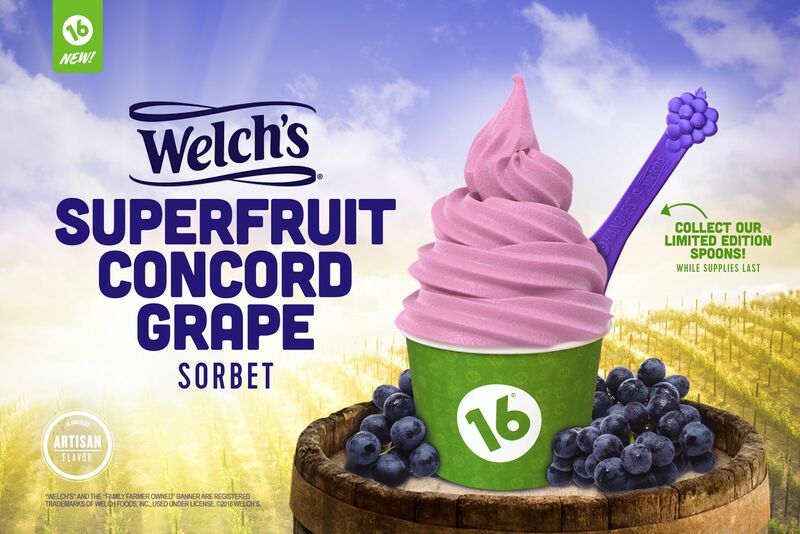 16 Handles Launches Welch’s Superfruit Mighty Concord Grape! (Restaurant News Release) This September, 16 Handles is partnering with Welch’s for the ultimate back-to-school flavor – Welch’s Superfruit Mighty Concord Grape! Made with Welch’s Concord grapes, this flavor packs in all the delicious flavor of Welch’s with the cool refreshing taste of 16 Handles Fro-Yo. To celebrate the new vegan and fat free flavor, 16 Handles has launched a new co-branded Welch’s spoon incorporating the brand’s iconic purple color and grapes. All guests who visit 16 Handles will receive the collectible spoons, while supplies last. “Welch’s is an iconic brand and a favorite back-to-school must have, and we’re excited to continue our partnership with them just in time for the school year. It’s exciting to be able to share one of my favorite brands as a soft serve flavor at our 16 Handles stores,” says CEO and founder, Solomon Choi. Founded in 2008, 16 Handles is New York City’s first self-serve frozen yogurt shop and is currently the number one frozen yogurt business in the city. It has since grown to 35 locations and is now expanding internationally. 16 Handles sets itself apart with unique store design, innovative marketing, artisan flavors, and over 50 toppings to choose from, including your favorite candy, fresh fruit, sauces, and more. They highlight individuality and customization, encouraging fans to “flaunt their flavor” both in their cups and their lives. Committed to sustainability, 16 Handles uses biodegradable packaging and spoons and the brand plants 16 trees per day through a partnership with Trees for the Future. For more information visit http://www.16handles.com, Facebook (http://www.facebook.com/16Handles) or Twitter (@16Handles).